I wanted to give you a quick update on our Whitechapel Refurbishment Capital Campaign, introduced on December 1. In just a few short weeks we’ve made it over halfway to our goal. Thanks so much for those who have helped us get this far! There is still time for those who want to join in. We are running the campaign through Generosity.com, a funding data manager for non-profits. To donate just click here and make your donation on line. To donate by check you can mail us at: BBR, PO Box 990828, Boston, MA 02118. We’ve had a fantastic winter concert and small ensemble season, including three exciting handbell strolls along Beacon Hill. 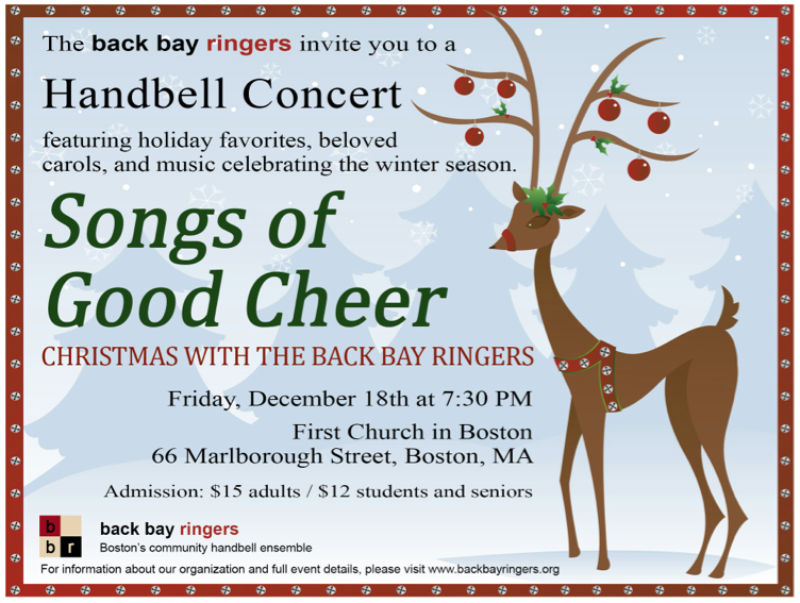 If you haven’t had a chance to enjoy our Songs of Good Cheer, do come to our final concert coming up this Friday, December 18th at 7:30 pm at First Church Boston (66 Marlborough Street in Back Bay). Hope to see you there!! Click the image for ticketing information!